Do you want your clients and prospective clients to feel cared for or abandoned? It seems obvious, but think for a moment how they might feel when you start blogging and then stop. Since I’d rather focus on the positive, let’s talk about how they’ll feel when you do show up. Because I don’t want you blogging out of guilt or obligation. I want you blogging out of a genuine desire to be of service, and a commitment to build the business you want. Prioritizing your blogging as a key marketing activity, being willing to consistently get out there and be visible, is how you show up for those people out there who need you, but won’t know you’re there if you stay small and silent. There is always room for improvement and discovery. When you blog consistently it keeps you thinking about how else you can help, what you can do better, what else there is to know, and how you can explain the same ideas in new clearer ways. It also helps model this mindset to your clients. If you act like someone who has “arrived” with it all figured out, you will not be credible or relatable because no one can achieve that. Done is better than perfect. To that I like to add, “but good is still better than bad.” Being authentic, conversational, and relatable is not an excuse to be sloppy or unprofessional. No matter how brilliant and important what you’ve written may be, it can still wait 30 minutes for you to walk away, come back, and proofread. Once that’s done, shore up the courage to release your writing to the world and the people who need your help. By showing up week after week or month after month (however often is right for you), whether or not you’re ready, whether or not it’s “good enough,” helps your clients embrace their own imperfections with whatever they’re trying in their own life (including the things you help them with). Self-esteem comes from the actions you take. Whenever you follow through and do what you said you were going to do, it boosts your self-esteem from being a person of your word. In this case, you’ve promised your social media followers and newsletter subscribers that you’re going to share new valuable content on a regular basis. When you tell yourself, “That’s okay, I can skip it today, it’s not really that important,” you’re breaking your commitment and that can eat away at your self-esteem. And since how you do one thing is how you do everything, keeping your daily blogging commitment can have a positive impact on other situations in your life where you have goals and habits you’d like to build. 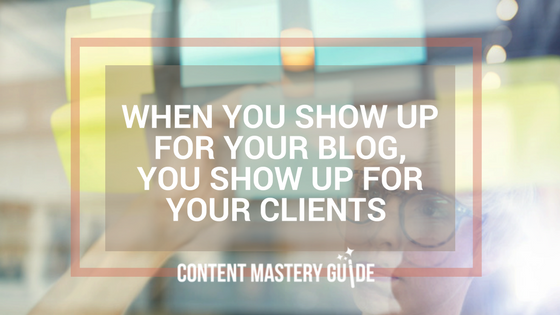 Other people notice when you’re showing up. Publishing consistently gives you credibility – not just with the clients and prospective clients who see that you care about them, but with search engines who are crawling your website all the time to assess whether you are a true authority on your topic. As you keep the conversation going, you maintain the perception you have lots to talk about and there is lots more where that came from. Blogging can feel like a difficult chore, and can be one of the first things to slip onto the back burner when life gets busy. Remember that there are people out there waiting to discover your next piece of valuable content, and all the other ways you can help them.